Fine art (giclée) prints with accurately calibrated profiles. sounding names ….. but meaningless so we avoid using the word! drum scans using our Heidelberg PrimeScan scanners. possible. This work is usually known as mastering. archival quality wide gamut inks are used for our fine art printing. whatever depth you wish.....you have only to ask us! 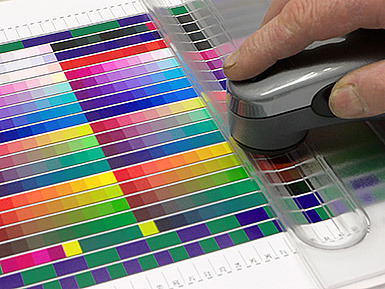 Accurate printing profiles are essential when making top quality fine art prints. We do this profile making work in-house so that we have total control of every part of the print making process and know it has been done correctly. We are able to ensure that prints ordered in the future will match any prints made by us previously. This is done by the regular calibration of the printer, by the measurement of the colours in your prints and by a visual check under controlled spectrally correct lighting conditions.